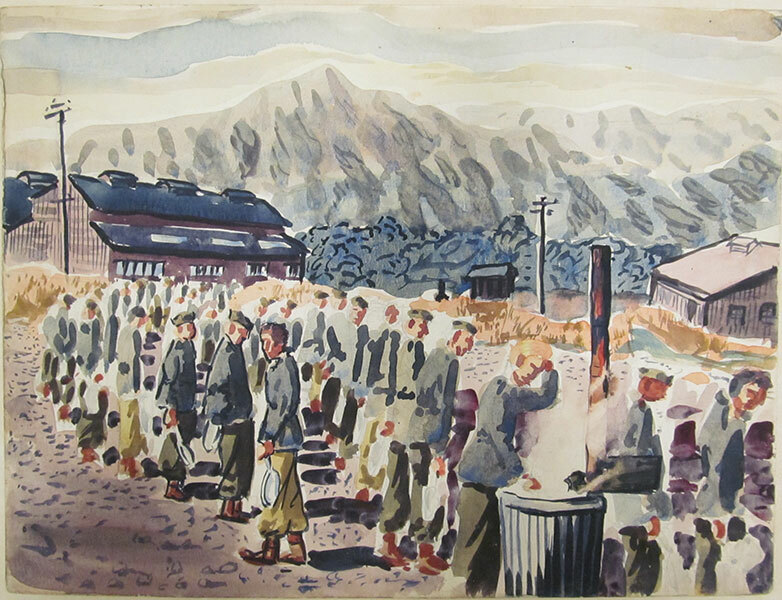 The current exhibit in the General Omar N. Bradley Memorial Art Gallery features the artwork of Milton Herbert Bancroft, depicting locations in France where U.S. Soldiers fought during World War I. Bancroft's works are supplemented with Army Signal Corps photos, from the USAHEC collection, showing Soldiers in France during and after the War. President Abraham Lincoln faced a dilemma as January 1865 dawned. 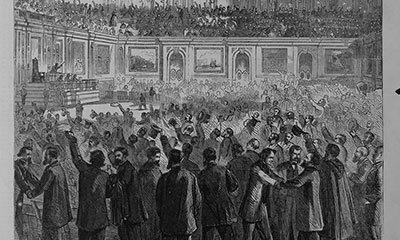 After an initial vote failed the previous June, the House of Representatives had renewed debate on a proposed 13th Amendment to the U.S. Constitution, which would abolish slavery. War-weary factions in the North and South were attempting to arrange a peace conference, but the news that peace commissioners might be en route to Washington alarmed many people in the capital. 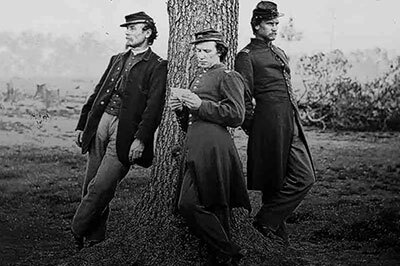 Radical Republicans demanded the Confederate armies surrender before discussing peace terms. Democrats, who had opposed Lincoln's antislavery policies, hesitated to support the 13th Amendment while a chance for a negotiated peace existed. Those Democratic votes would be necessary to achieve the necessary 2/3 vote on the amendment. Travel along with Abial Hall Edwards's and John Terrill Cheney's Civil War Experiences through letters written home to loved ones. Also learn about "Women in the Civil War" and "Civil War Illustrators"
Brilliant reds, tempestuous blues, and camo greens gave life to Army cook Sergeant Angelo N. Gepponi's memories as he recorded them with paint and pen throughout his service during World War II. For the first time, his striking artwork will be revealed to the public more than 70 years since its creation. Cook Pot and Palette, a new exhibit of his work, will be on display in the Omar N. Bradley Memorial Art Gallery at the USAHEC, July 16, 2015 through May 23, 2016. Comprised of 14 drawings sent as Victory Mail (V-mail) to his girlfriend back home, 18 portraits as unique as the individuals they depict, and 15 stunning watercolors painted throughout his unit's travels, this exhibit contains such variety that everyone will encounter a favorite they can relate to. Ms. Nina Talbot interviewed veterans from various time periods (WWII through the Global War on Terror). 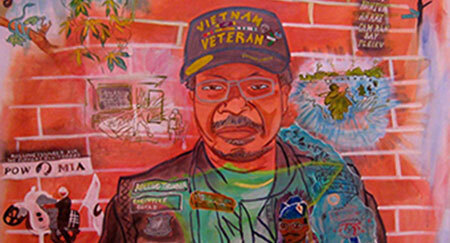 Based on these interviews, she created paintings that capture the image of the veteran and their experiences in the military. 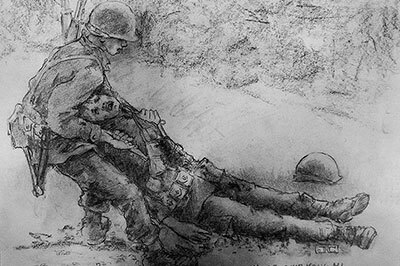 The paintings featured at the USAHEC will be 13 veterans of the United States Army and will be displayed in the General Omar N. Bradley Memorial Art Gallery. 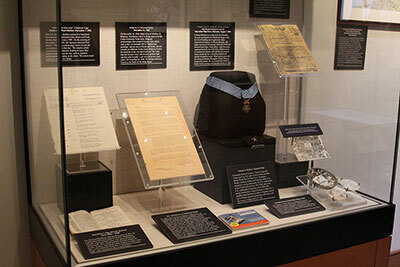 The Army Heritage Center Foundation is sponsoring the exhibit. VETERANS will open July 17, 2014 and close April 5, 2015. Ms. Talbot and selected veterans will be on hand for the opening to share their experiences. He was a man who came not from wealth and privilege, but from a family that instilled the values of hard work, education, piety, and the ability to rely on oneself. Born in 1893, young Omar walked to school with his father from an early age. He would learn how to provide the family with food through hunting and fishing. In 1911, he accepted an appointment to the United States Military Academy and graduated in 1915 as part of "the class the stars fell on." 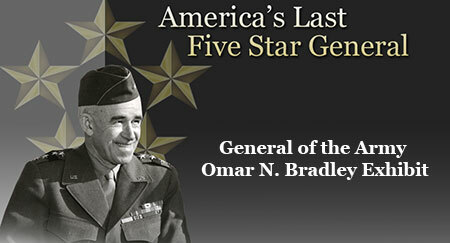 Missing World War I, he spent the interwar years as a student at such places as the Infantry School, the Command and General Staff College, and the Army War College, and teaching as an instructor at West Point and Fort Benning. Nearly every historical era of the United States has impacted Carlisle. At its beginning in 1751, Carlisle was a place for traders and travelers to start their voyages west over the mountains. The seed of Carlisle Barracks was planted by the British in 1757 with Colonel, later Lieutenant General, John Stanwix establishing a post, which supported British operations in the French and Indian War. The next year, British Brigadier General John Forbes and his troops made a stop at Carlisle as their expedition worked west to the forks of the Ohio River. Within weeks of the United States entering the First World War in 1917, President Woodrow Wilson knew that national support of the American people would be essential to winning the war. The Society of Illustrators in New York City was tasked to find a way that artists might assist in the war effort. Under the leadership of Charles Dana Gibson, its members launched what became the Division of Pictorial Publicity. 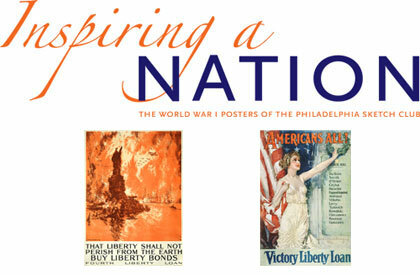 It was part of the Committee on Public Information, created by President Wilson and charged with designing posters that would encourage patriotism and sacrifice on the home front. More than three hundred of America's foremost designers, illustrators, painters, and cartoonists worked for the division. They had the responsibility to illustrate for the people the demands of the Great War and to place on every wall in America the call to patriotism and service by showing the stories of courage, suffering, heroism, and, most importantly, confidence for victory.